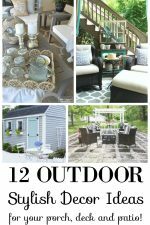 My Outdoor Oasis-Outdoor Decor and Entertaining Ideas! Summer means enjoying Outdoor Living and bringing the indoors outside! 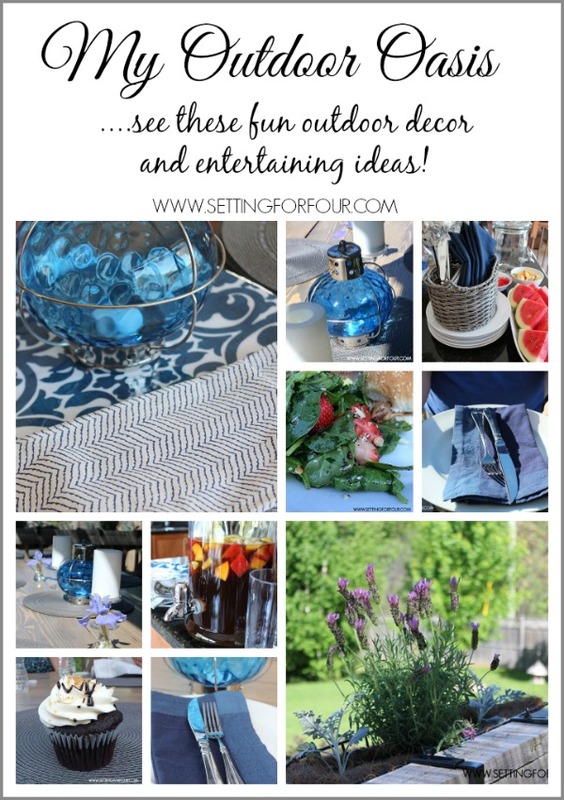 See my Outdoor Oasis Decor and Entertaining Ideas! 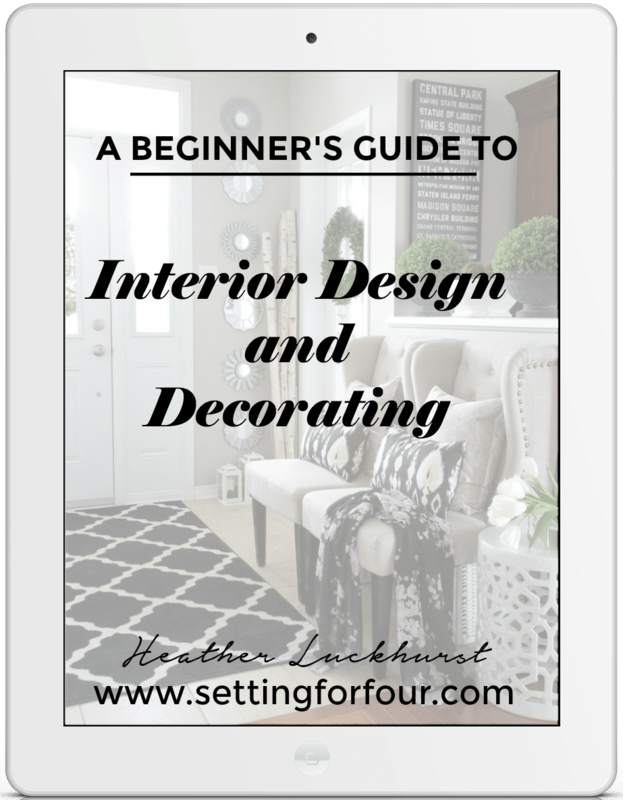 Last week I spent a lot of time indoors on my quick and easy living room makeover, but usually when summer arrives I spend most of my time on my deck where I love to create a relaxing outdoor oasis with flowering plants, our dining table, chairs and decor! I love to make my outdoor dining area an extension of my home and bring the inside out! The weather was gorgeous, sunny and warm…and there wasn’t one mosquito to be seen! Six of our friends came over and we spent the afternoon chatting and catching up with each other’s busy lives! To get the party started, I served up my tasty Lemon Blueberry, Pomegranate Ice Tea. 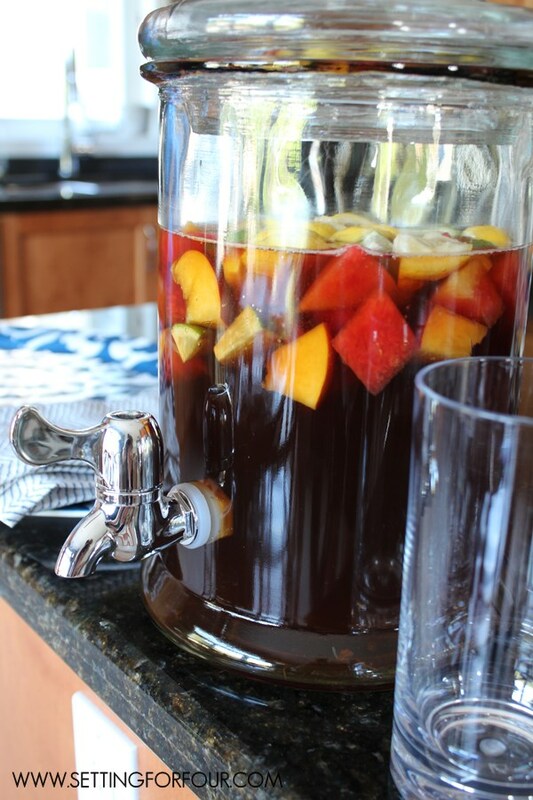 Our friends loved the looks of this large clear drink dispenser with it’s apothecary style lid and as a hostess I love the fact that it’s a way for my guests to serve themselves drinks!! We had a bucket of iced bottled beverages on standby too. 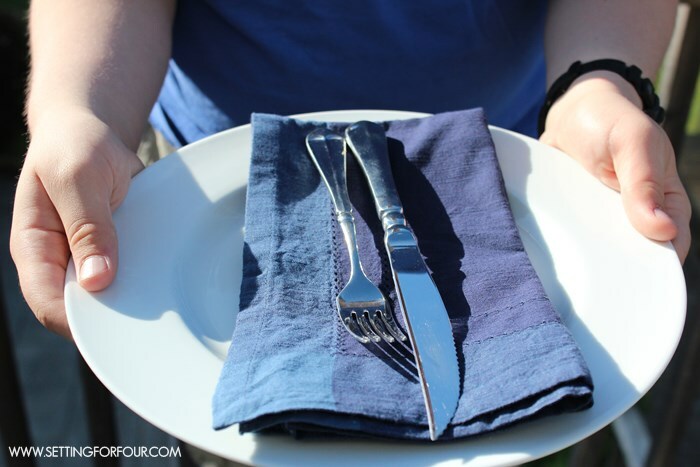 I used this large blue and white Trellis platter to carry these the tumblers, these pretty navy blue hemstitch napkins and blue and white chevron napkins down to my deck in one trip…. so convenient! 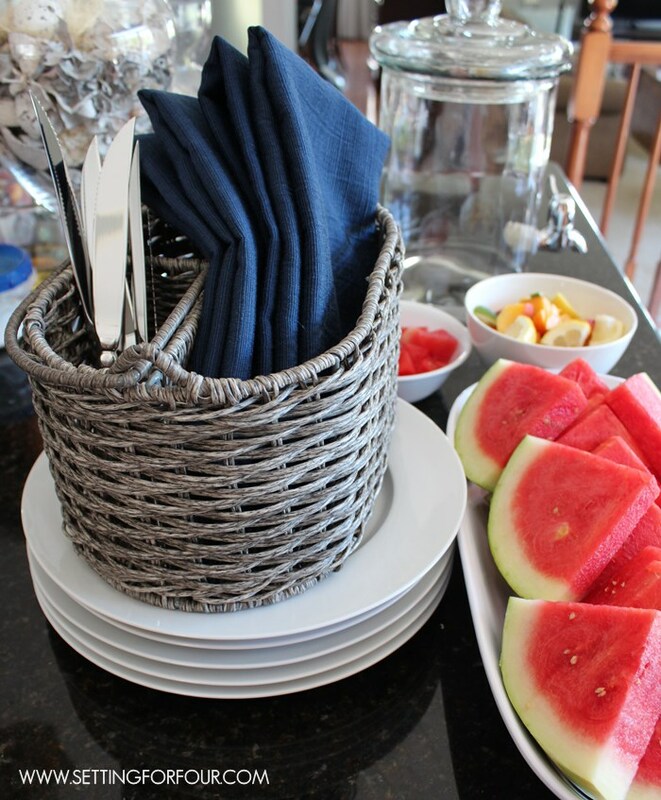 I love this platter – it’s shatterproof and perfect for outdoor entertaining! I’ve used it to serve desserts too – it’s the perfect size to hold a batch of my yummy Coconut Lemon Lime Bars with Shortbread Crust! 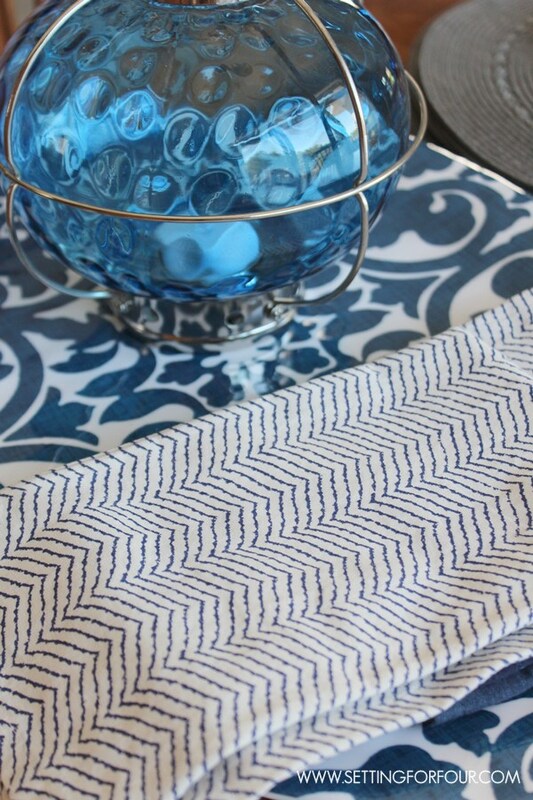 My oceanic blue decor items make me feel like I’ve escaped to a luxurious seaside hideaway! I grew up on the beaches of a freshwater lake so I love any excuse to decorate with watery blues! 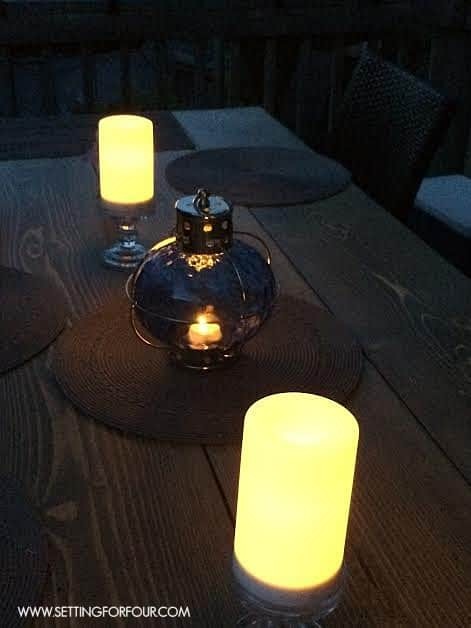 I decorated our table with pillar candles and this gorgeous blue lantern. I used LED candles in the lantern – our guests really loved how it glowed at night! For supper we served this yummy Strawberry Salad with Poppyseed and Sesame Seed Dressing, barbecued hamburgers and Italian sausages. Our friend brought over these yummy cupcakes from a local cupcake business for dessert – thanks PJ!! We had a great afternoon and evening of eating a delicious meal, sipping on drinks and chatting til the sun went down! I can’t wait to host our next get outdoor party – isn’t that what summer is about? Enjoying the outdoors and catching up with friends! 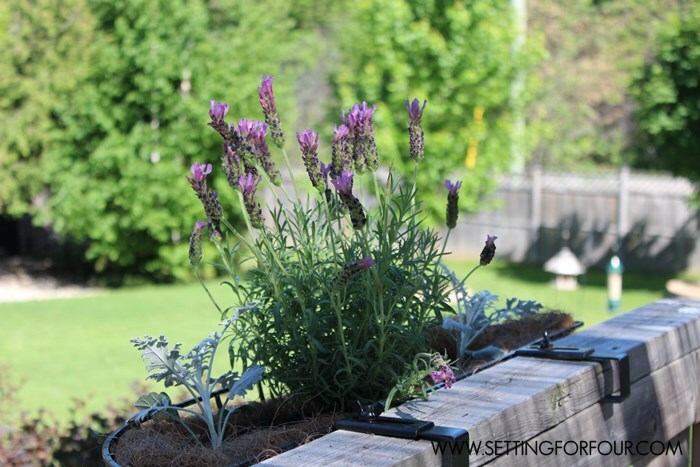 Would you like to see more beautiful outdoor oasis ideas to create one of your own? Me too Tara!! Pier 1 has several great choices for outdoor lighting! Thanks for visiting! 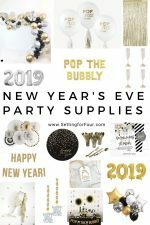 Looks like a lovely party! That punch looks so delicious… and the cupcake too! Thanks Virginia!! 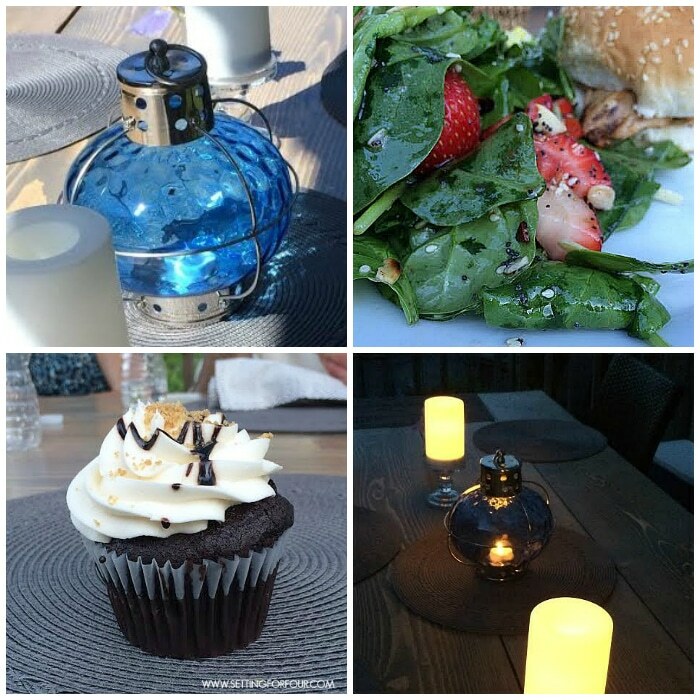 We had a great time – isn’t it nice to enjoy the outdoors with friends and lovely decor? Your table party decor looks great, and I am going to use your recipes suggestions for my next girls nigh at my home. Fabulous – I’m glad you found some recipe inspiration! The Strawberry Sesame Salad is always a huge hit with our friends!! I’m glad you like my table decked out with Pier 1 Imports prettiness! Thanks Jamie – I love edecorating with the blue tones! Indigo, lapis blue and watery blues…love them all! Thanks Ginnie – we had a great time catching up and relaxing with some good food and the gorgeous decor! Beautiful outdoor space and great ideas. Thanks to your husband for his service to our country and your family for your sacrifice. You are so thoughtful and sweet to say that – Thank you!!! 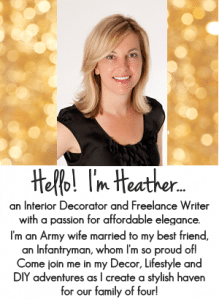 I’ll pass on your comments to my hubby! Great ideas! I love celebrating outdoors during the summer. Thanks for sharing your ideas. You are so welcome Jill!! I can’t get enough of being outdoors this summer after the long winter we had! Whew! I love windchimes! Thanks for entering and visiting Lyn! I adore Pier I !!!!!!!!!! Love the blue.. thanks for the giveaway!! ps I’d pick out all the lanterns… I cannot resist!! The lantern’s are gorgeous I agree Anne!!! 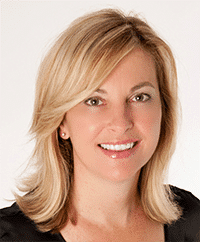 You’re welcome Anne – thanks for visiting and entering the giveaway! I love how many practical things Pier 1 has. I got curtains for our sons room there and they were perfect for a nursery and still work now in his big boy room. I’m so glad you love Pier 1 Imports too Jen! I would choose a papasans with a colorful cushion for our porch! All of the lanterns are so pretty. i would love to have them on my deck. I would pick the Isabelle End Table! Everything looks so great! Loving the Serge Stripe Pillows from Pier 1. Thanks! Thanks for visiting Sandi! Good Luck in the Giveaway! I love those serving bowls!! Adorable! LOVE all the blue! So Pretty! We are just getting our backyard into shape now! Can’t wait until it’s finished so we can finally do some entertaining! I hope you get your yard finished real soon and enjoy your summer outside Britt! I’m all about dishes…always!! 🙂 So my choice would be the Trellis platter in green. Gorgeous! I love the green version too! I love the red crackle lantern. It would look great with all my new summer red items. I adore that blue colour you chose. Nicely done! Beautiful! I love your colour palette and I especially love that drink server. Gorgeous! 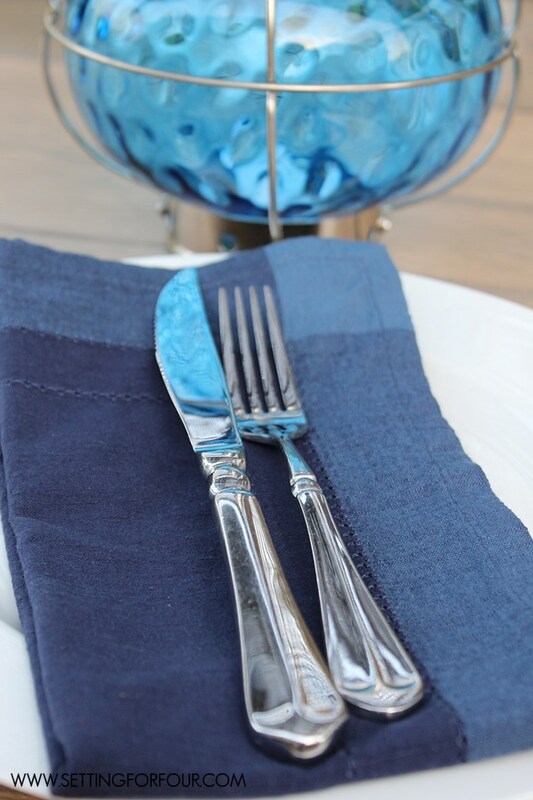 LOVE love love the blue and white- such a beautiful table setting. 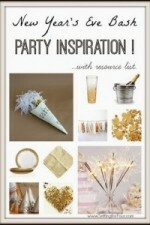 You are a master of creating a lovely ambiance – wish I could come over for a party!! The blue lantern is my favorite. I really love the Catalina Cove Rug. I love the blue Rania table. I might have to go “take a look” at it today! What a beautiful setting, Heather. Very inviting and cozy. I love each and every detail. Pier1 is one of my fave stores.